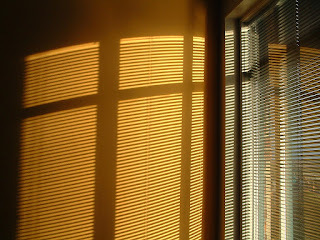 Spaniards living in Holland miss something very important when they wake up in the morning: window blinds. The Netherlands might not be a sunny country, but the light here is pretty incredible. There is a myth that the light in Holland is different from anywhere else. This is probably caused by the permanent humidity, even if it is not raining. Painters and writers have been fascinated by the Dutch light for decades. Houses here do not come with exterior blinds already installed as in Spain. Though we have been trying to adapt and get used to the light in the morning, it is hard... specially on weekends, when you always want to sleep a little bit more :-). If you live in a rented house like us, you cannot install exterior blinds so we tried to block the light with venetian blinds but, as you can see in the picture, they are not very effective. Then, the only solution to prevent the light from waking you up in the morning is to have blackout curtains and they have to be very well installed to block the light completely, so we are still working on that. Los españoles que viven en Holanda echan de menos algo muy importante cuando se levantan por la mañana: las persianas. Holanda puede que no sea un país muy soleado, pero la luz aquí es increíble. Existe un viejo mito de que la luz en Holanda es diferente a la de cualquier otro lugar. Probablemente se debe a la humedad permanente, incluso cuando no llueve. La luz en Holanda ha sido objeto de fascinación durante décadas para muchos pintores y escritores. En Holanda, las casas no tienen las persianas exteriores ya instaladas como en España. Aunque hemos intentado adaptarnos y acostumbrarnos a la luz, es duro... especialmente los fines de semana cuando siempre se quiere dormir un poquito más :-). Si vives en una casa de alquiler, como nosotros, no puedes instalar persianas exteriores así que intentamos bloquear la luz con persianas venecianas pero, como podéis ver en la foto, no es muy efectivo. La única solución para evitar que la luz te despierte por la mañana es poner cortinas tipo "foscurit" y tienen que estar muy bien instaladas para que bloqueen al 100%, así que aún seguimos trabajando en ello. It is shocking when in summerit is 11 pm and still light. Also shocking when it is 4.30 in winter and it is dark and cold. True, light is indeed beatifoul here but I miss the sun we used to enjoy in Spain, probably one of the things I miss the most. Nunca me había animado a escribir pero bueno sólo deciros que me encanta vuestro blog. Por cierto igual te parece una tontería pero ¿habéis salido en españoles por el mundo? @Juan Manuel E.R., hummm if I had to choose what I miss the most... it's probably something more abstract than the sun. It's a feeling I have deep deep inside, like "I don't belong here completely"... something like that. Though sometimes I think the same when I am in Spain :-) I miss the feeling of sharing the same language, culture, sense of humor, vision of life, etc. with others around me. Nosotros no hemos salido en "Españoles por el mundo", los que sí han salido son nuestros vecinos de ALT164.